Anyway… I know everyone writes these kind of posts, but, truth be told, I love reading all of them. There’s nothing quite like finding a new treasure trove of inspiration that makes your brain start doing somersaults and firing off ideas like you’ve downed a litre of coffee, and as a designer it’s important to keep abreast of what’s going on in the industry – what are the latest trends and styles? What new cutting-edge HTML/CSS wizardry is happening out there? What new camera equipment has just been announced that costs more than your entire life savings and house? So, without further ado, here are five places that I go to for inspiration. They’re not numbered because they’re all brilliant in their own ways, and hopefully some of these sites may be just what you’re looking for. 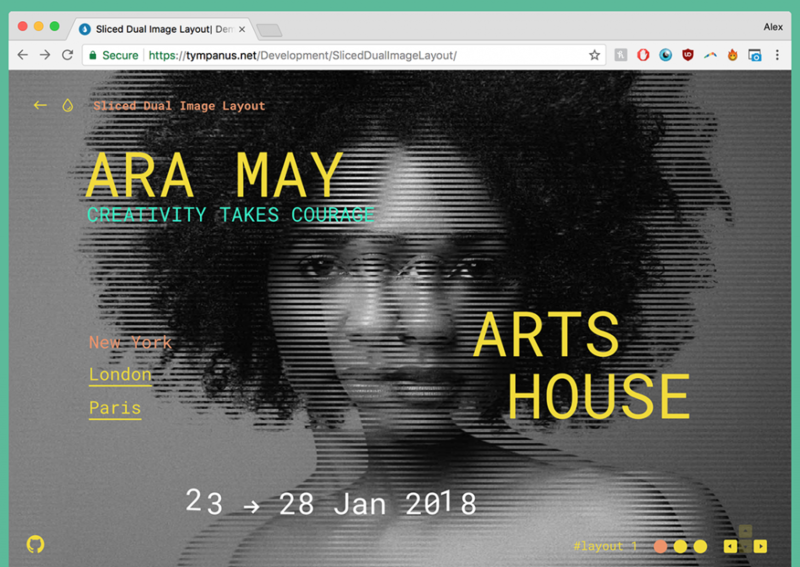 It seems to be getting more and more popular now, but for quite a few years Codrops by Tympanus.net has been my go-to website for front-end web design inspiration. Some of their concepts are just too advanced to actually implement (web browsers still have some catching up to do) but others are just brilliant, inspired solutions to design or content presentation problems. They also have a fantastic collective online magazine-type collection of resources from around the web which gets released every week or so, which is well worth looking through. Yeah, the big daddy of design inspiration. 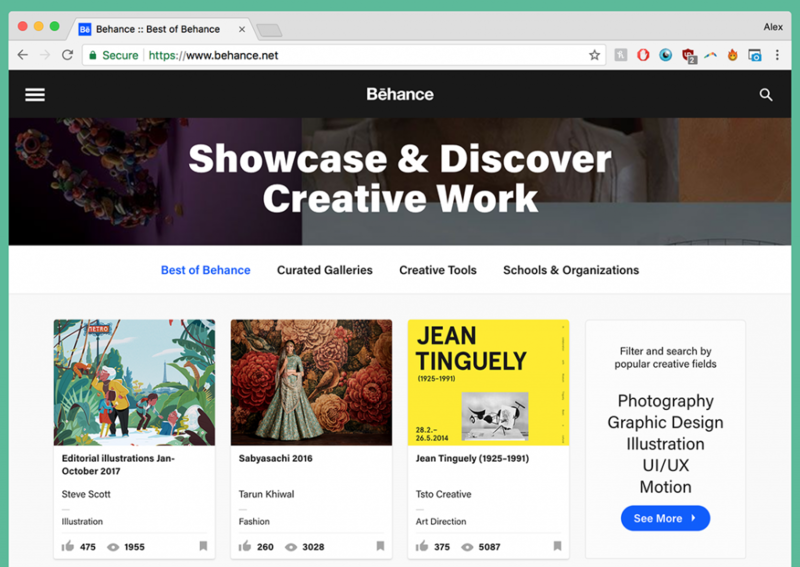 I was in two minds whether to include this or not, because if you’re a designer and you haven’t heard of Behance then… where have you been? But seriously, it’s an absolute goldmine of projects from some of the most talented creatives in the world. Some of the case studies on the site are just mind blowing, so don’t visit if you want to feel better about your own work… but do visit if you want to be pushed to new creative heights. This is a fantastic resource for free photography. Stock images? Who needs them, especially if your budget is, like mine, a big fat £0. 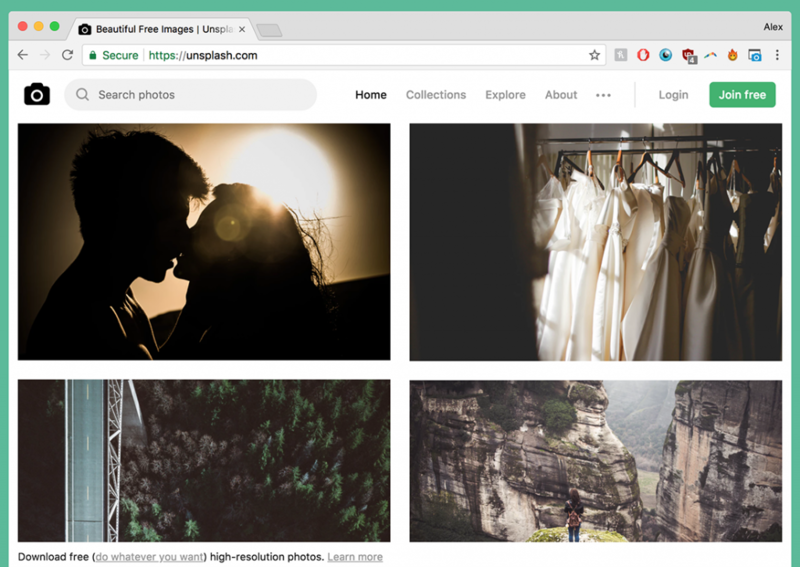 Photographers from all over the world are sharing some fantastic images that are free to use (it’s good practice to include a credit if you use one). As a photographer, it’s a great way to get your images out there – you can click through to the photographers portfolios and jump onto their websites or get in touch if you want to commission them. As a designer… free images? Need I say more? Another site that should be a staple for every designer out there. 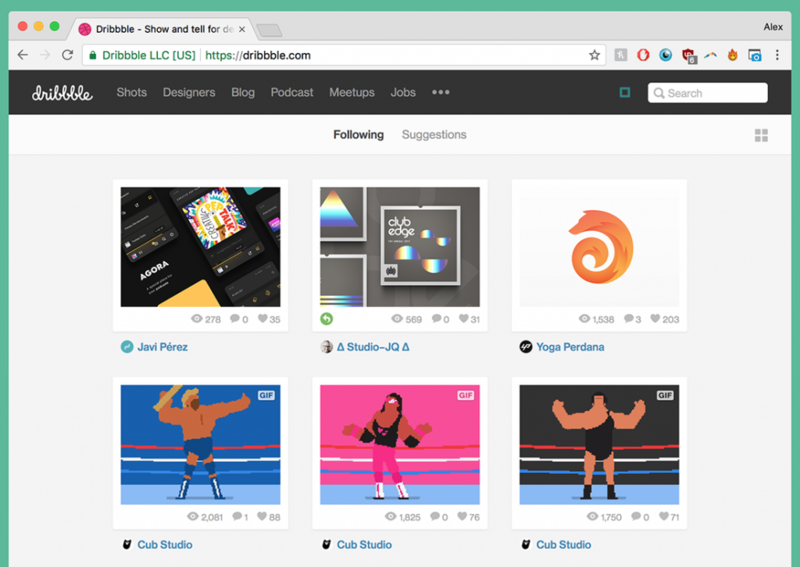 Dribbble is a great little resource for creatives, although it tilts heavily towards design/illustration with some web/application stuff sprinkled in there. Again, the standard of work is jaw-dropping and it’s also a great way to network and chat to your peers and design idols. 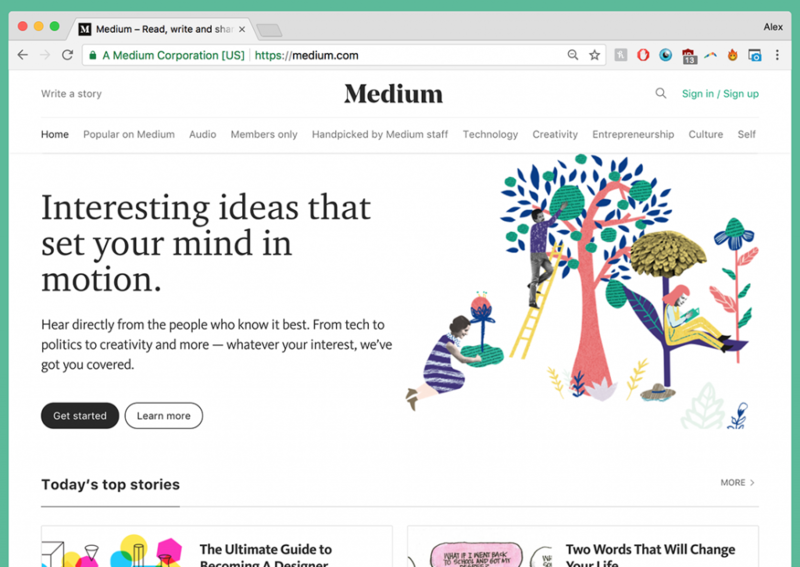 Not specifically a design resource, Medium is more of a blogging platform that leans towards articles. I first came across Medium when Teehan+Lax (one of my favourite design agencies ever) posted a case study of their design process for the first iteration of the Medium site. It’s evolved massively since then, and Teehan+Lax have sadly folded so the case study is no longer available, but Medium still proves a fantastic resource if you want to jump more into the why’s and how’s of design and development. I’ve learned a lot and sharpened my critical/analytical thinking by studying some of the articles, and more are being added all the time so it’s definitely a site worth checking out for any creative. And that’s it. My exhaustive list. Not! But I hope that I’ve given a little back to the design world that’s given me so much, and I hope that some of you readers have found this post helpful or inspirational. Just remember to browse the sites for a bit, and then close them down and actually do some work!